InfoSec Handlers Diary Blog - Winpmem - Mild mannered memory aquisition tool?? SANS ISC: InfoSec Handlers Diary Blog - Winpmem - Mild mannered memory aquisition tool?? Winpmem - Mild mannered memory aquisition tool?? There should be little argument that with today's threats you should always acquire a memory image when dealing with any type of malware. Modern desktops can have 16 gigabytes of RAM or more filled with evidence that is usually crutial to understanding what was happening on that machine. Failure to acquire that memory will make analyzing the other forensic artifacts difficult or in some cases impossible. Chad Tilbury (@chadtilbury) recently told me about a new memory acquisition tool that I want to share with the ISC readers. It is called winpmem. It is written by Michael Cohen. It is free and it is available for download here. Here is a look at it. Now, some of you may be thinking, "So what! I can already dump memory with dumpit.exe, Win32dd.exe, win64dd.exe and others." Well, you are right. But if you have malware that is looking for those tools, now you have another option. While winpmem might look like a mild mannered memory acquisition tool, it actually has super powers. 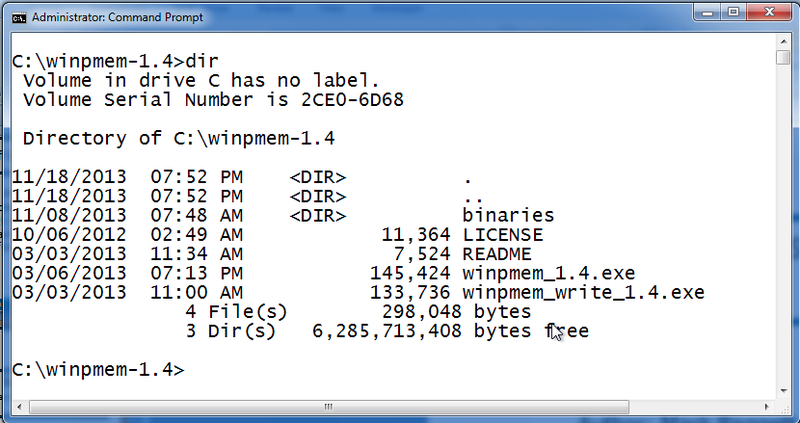 The BEST part of winpmem (IMHO) is in those components that I conveniently glazed over. 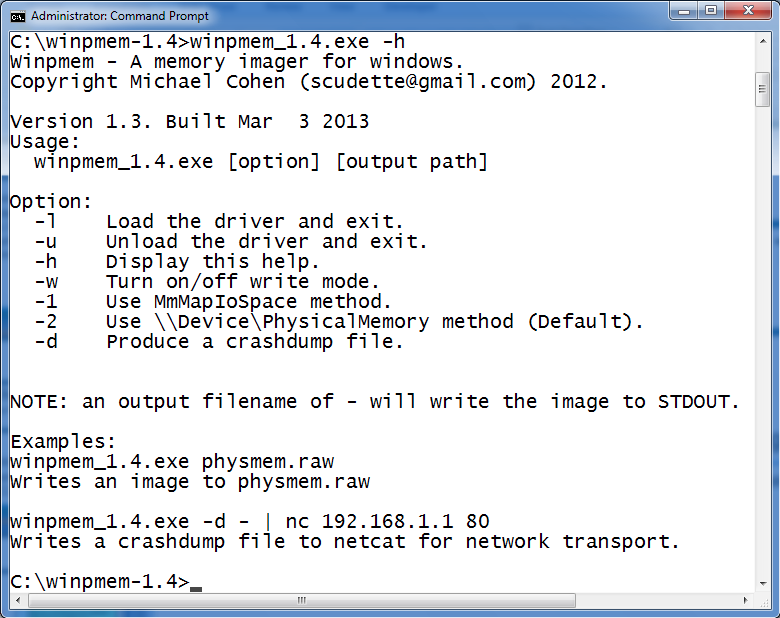 I'll take a look at winpmem_write_1.4.exe and, better yet, that Python script in my next journal entry. Interest in Python? Check out SANS SEC573. Python for Penetration testers! I am teaching it in Reston VA March 17th!